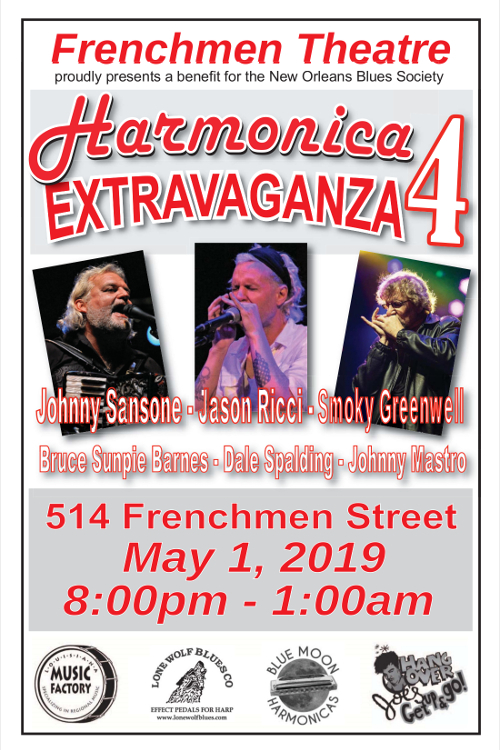 Can't wait for the 4th annual Harmonica Extravaganza at the Frenchman Theatre on May 1st (2nd Saturday of Jazz Fest) - 8PM-1AM! Come see Johnny Sansone, Jason Ricci, Bruce "Sunpie" Barnes, Dale Spalding (of Canned Heat), Johnny Mastro, and yours truly. I am expressing my concern for our current political crisis. I have written two songs: "Get Out and Vote" & "Slow Moving Coup". The complete songs are available for radio play, rallies, etc. Also, there are 15 and 30-second segments designed for ad placement. I retain the copyrights but am making these recordings available free to the progessive movement. When the word “blues” comes up for discussion in New Orleans musical circles, the name Smoky Greenwell is certain to be mentioned. Since taking up the harmonica in the 1970s, he has performed with a virtual who’s who among nationally and locally renowned musicians, in addition to fronting his own blues bands for many years.